YASUYOSHI SAITO. Interview By John Cheetham. THOUGHTS ON SELF-DEFENCE AND KIHON. By C.W. Nicol. TALENT, TECHNIQUE AND SKILL. By John Holdsworth. HOJO-UNDO (Karate's Forgotten Training Methods). By Mike Clarke. MATT PRICE. KUGB GRAND CHAMPION. Interview By Duncan Randall. SQUEEZE AND RELEASE IN KARATE TECHNIQUES. By Ben Woodhead. SHOTOKAN KARATE AND BAD LANGUAGE. By Sunil Agalgatti. Welcome to the first issue of 2003 and a very Happy New Year to all SKM readers. It's great when you come across people who may not be too well known worldwide, but nonetheless, are very talented karateka and great teachers. Our feature story is a perfect example. Yasuyoshi Saito sensei may not be too familiar to many of you but his karate ability, technique and humble personality are commendable. For instance, how many professional karate instructors, Japanese (or Western) do you know who will teach classes just for the love of teaching their art, just simply for the pleasure of trying to genuinely help students understand and hopefully improve their karate technique and knowledge? Well, Saito sensei did just that when he visited England recently, which was a very pleasant surprise for me and my fellow students. It was a real treat! He was over here with five of his students from his Miami dojo on what was more or less a holiday. Being the serious karate instructor that he is, Saito sensei wanted to do some training whilst he was over here but didn't have a dojo to use, so I happily suggested our dojo. So, we hosted sensei Saito and his students for two brilliant days of Shotokan training under an extremely gifted sensei. His focus is on fundamental training. I think you will find his interview different, informative, educational and entertaining, I feel that it's a 'gem' of an interview! SKM is highly honoured to welcome a new contributor to the magazine, namely C.W. Nicol, the famous author of 'Moving Zen', which undoubtedly was, and still is one of the best books ever written in martial arts literature. It explores deeply into training in Japan (early 1960's) and in particular the training and life at the Japan Karate Association (JKA) hombu dojo. C.W. 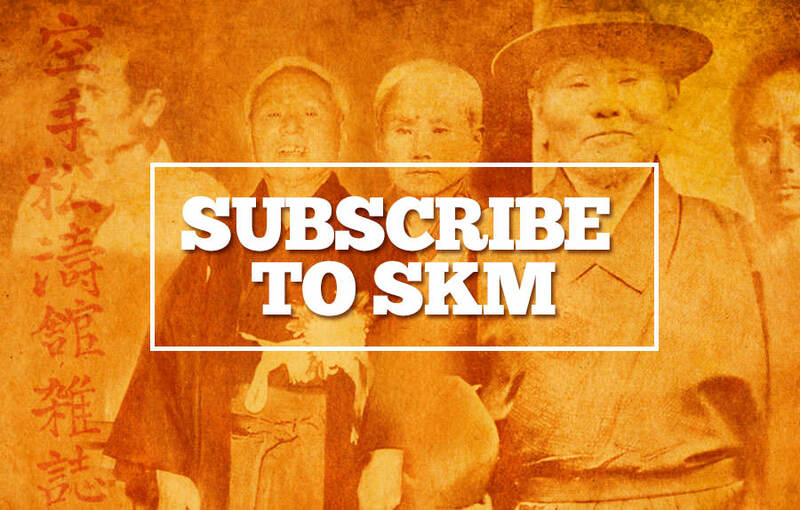 Nichol, (a professional writer, explorer and karateka) I'm happy and proud to tell you, likes SKM very much and hopefully will become a regular contributor over the years. His first article in this issue to me, is simply, 'the voice of experience' speaking, so, all you young students out there, take it on board, you won't regret it. Another feature in this edition is the present golden boy of the mighty KUGB organisation, Matthew Price, who appears to have taken over where the famous Frank Brennan left off. He is dominating both the kata and kumite events which is all credit to the emphasis within the KUGB on developing competitors (and students) who do both disciplines well, as opposed to the sport karate angle where they usually specialise in either one or the other - kata or kumite. 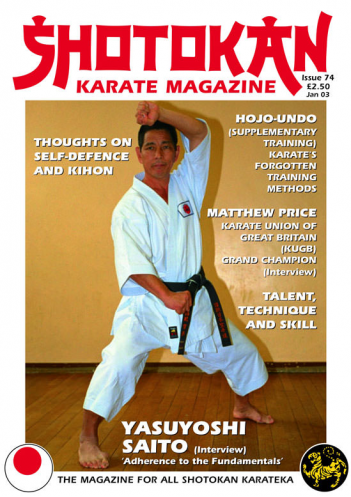 Matt Price is a very serious trainer who practices karate as an art, as you will discover, and there are some very sound tips on training for everyone, regardless of whether you have an interest in competition or not. Mike Clarke's article on Hojo-Undo (traditional supplementary training) is a great insight into how Okinawan karateka trained (and still do) and how this type of extra physical conditioning practice was lost and virtually abandoned once karate became popular on mainland Japan. We've had to increase the cost of SKM from this year and publishing will now be every January-April-July-October.